You have to admire anyone who can run a marathon, but I take my hat off to client Susie Perkowitz who takes her running to the extreme. This week she is taking part in the TransRockies Run, a 6 day, 120 mile adventure with 20,000 feet of gain. Susie was diagnosed with diabetes shortly after completing the race last year but it has not deterred her from running again. This year’s race kicks off her fundraising campaign: Go! 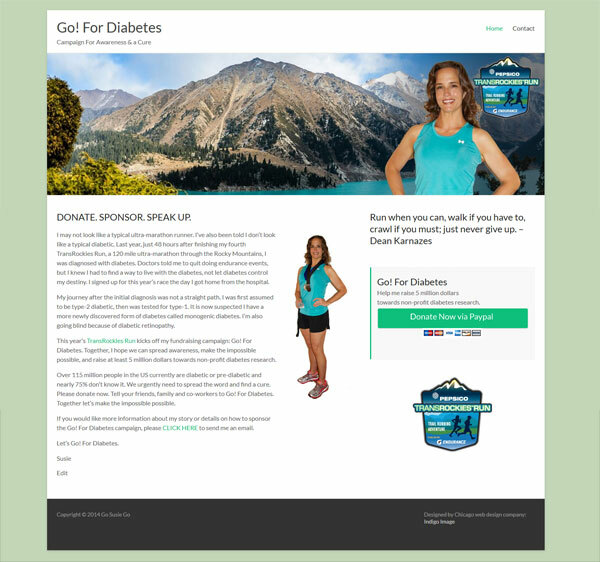 For Diabetes., her new website was launched on Monday. This entry was posted in Chicago Web Designer, Responsive Web Design. Bookmark the permalink.